The devastation of a Kashmiri protester who witnessed Qaiser Amin run over & killed by an Indian army jeep. 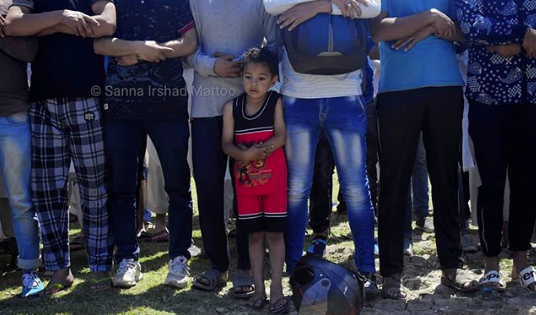 The occupation is not made for human beings or other living things. 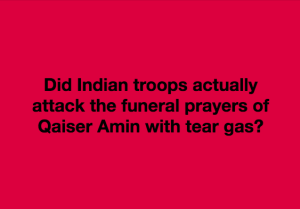 Our heartfelt condolences to this man & to all Kashmiris. 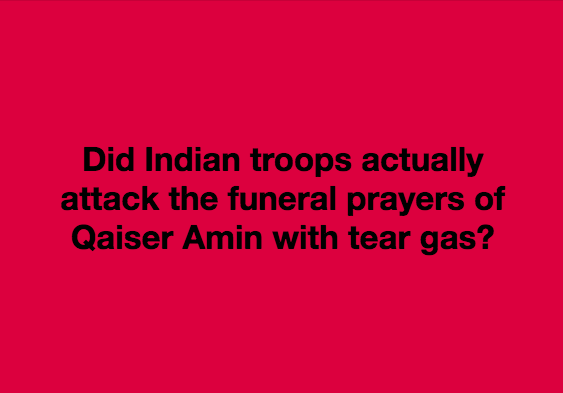 Funeral prayers for Qaiser Amin: it isn’t hard to imagine the affect the grief & anger over Qaiser’s death will have on small children. India can kill freedom fighters, but cannot kill the commitment to freedom. India cannot touch the lives of small children so cruelly & think it will came out ahead in destroying resistance to occupation. For so many years I did not express my loathing for the annual Left Forum in NYC but it was like attending the vampire’s ball. They’re elitists & I never wanted to be a part of that left. There’s no there-there for me & someone like me is completely invisible to them. When they were all clamoring for humanitarian bombing of Bosnia in the early 1990s, that was my out & I never put myself through that ordeal again. Now this weekend, one of their featured speakers was Ajamu Baraka, the Green Party guy who is an ardent supporter of Assad & Putin. Anybody who holds up Baraka as a champion of the people isn’t talking about Syrians, Palestinians in Syria, or working people in any country. You can see the connection made by those who run the Left Forum between humanitarian bombing of Bosnia & Syrian & Russian bombing of Syria. 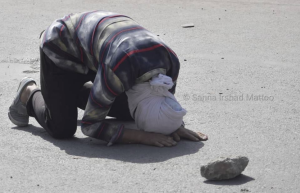 Stand With Us, the Zionist propaganda site, claims that already in June, an Israeli soldier was killed by a Palestinian stone pelter & that in one year 116 Israeli civilians were injured by stone pelters. They almost make a mockery & certainly make a farce of propaganda. Now here in spades is the problem with posting unsubstantiated claims. You hand the Zionists a weapon to discredit the Palestinian struggle against apartheid & genocide. It took them less than 24 hours to go on the offensive against the claim that this soldier was the sniper who assassinated Razan al-Najjar so that now the narrative is about this deceit rather than the death of Razan. Those who posted it refused to take it down because it received thousands of likes & shares. You cannot sacrifice factual reporting for likes & shares on social media because this is what happens. The soldier claims she hasn’t been in the Israeli military for a few years & is now receiving death threats. Who knows what the truth is? But it must be said that human rights activists do not approve of threatening the lives of political opponents. That is not how we operate. Now for sure, Zionists will attempt to drown out Palestinian grief over the loss of a beautiful soul by defending this militarist from false charges. Hopefully, those who fell victim to this shameful deceit will learn to query such serious accusations & not just like & share them like the gospel truth. You gotta take a look at this. When she got a royal drubbing last week from Texas students shouting her down as a war criminal for supporting Israeli snipers shooting down unarmed Palestinians, Nikki Haley who snarls through her teeth like a pit bull, was struck dumb as a stump. This is her, hand to heart & gushing, feeling the love at the AIPAC conference last March. Trump, Netanyahu, & Senator Robert Menendez also received a hero’s welcome. Menendez thanked AIPAC for supporting him during his corruption trial. Who next on the AIPAC podium? Suu Kyi? Duterte? Putin? Assad? 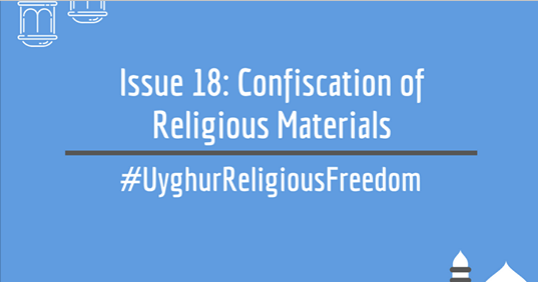 “In 2017, Chinese authorities in East Turkistan ordered Uyghurs to hand in religious materials, including copies of the Quran, prayer mats and religious books. Chinese police reportedly sent out an order over social media instructing Uyghurs to voluntarily hand in these items or face punishment. Qurans and prayer mats are essential to practicing Uyghur Muslims and almost every Uyghur household would possess these items. Their confiscation is a needlessly oppressive measure that makes it impossible to meaningfully practice Islam. 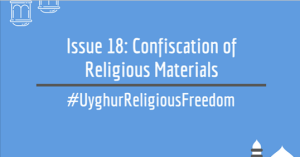 The confiscations are part of larger initiative, the “Three Illegals and One Item” campaign, by the Chinese authorities which bans “illegal” publicity materials, religious activities and religious teachings that officials consider to be ‘extremist’. The campaign seeks to establish Chinese control over every aspect of religion, including activities that are normal and mundane for the rest of the world, such as owning a Quran. A very moving story by Bilal Ahmad about 18-year-old Adil Ahmad Yadoo who was run over & killed by an Indian armored vehicle on May 5th. None of these young men & women should die without our acknowledging their contributions to human freedom. Every once in a while, & now again after the horrors of Yarmouk, I want to personally reach out to old antiwar & socialist activists I once worked with to urge them to more carefully study & rethink their support for the Assad regime & bombing of civilians. But I know they will scoff because I am a working class woman activist & not a credentialed academic or eminent left male guru, most of whom support Assad & haven’t done a damn thing politically in nearly 40 years. Therein lies the incapacitating problems of the left that make them impotent & discredited: snobbery, elitism, do-nothingism, misogyny. If you’re wrong on Syria, you are not even close to progressive but are marching with the extreme right, including fascists. 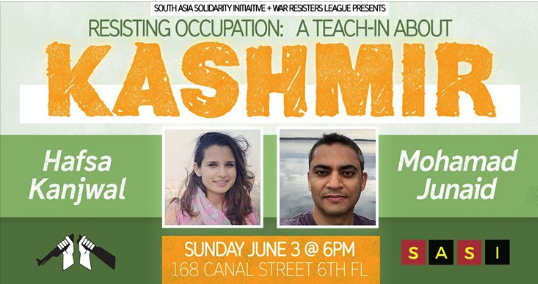 Just a reminder for those in or near NYC, this should be an invaluable event for understanding the freedom struggle in Kashmir. Today at 6 pm in Manhattan.